I’m finally at a point with our landscaping that I feel I can share a few pics.It’s taken a while to get here, we are not done, but it’s moving forward. 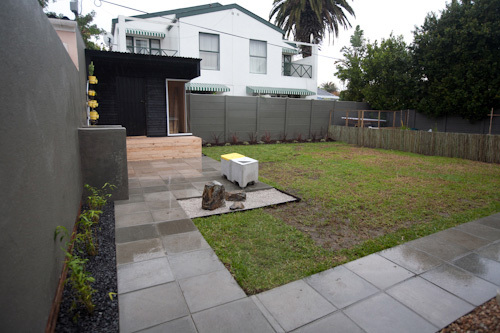 As shared in my previous landscaping post the idea was to subdivide the garden, which was largely lawn by creating space for a patio, a playhouse for Nathan and pockets of form plants and textures. My deadline was June 17th, I missed it, but as of today I’m where I wanted to be. I went a little overboard on the playhouse, which became a black Nordic inspired cabin with a deck and almost floor to ceiling wrap around window, but I LOVE it! Sadly I had a fight with my contractor and threw him off site during the building, which meant I had to do a lot of the work myself, action-ed in dribs and drabs with all this rain we’ve been having. 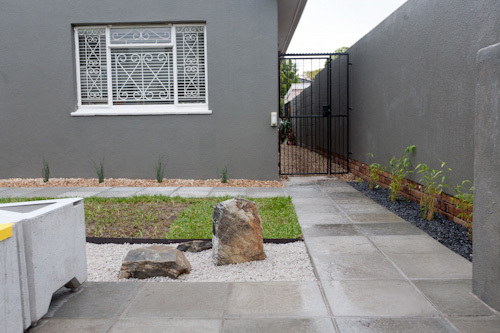 I designed and coordinated the hard and landscaping, but enlisted the help of my friend Anton Fourie from Stonescapes and his staff to action my ideas, something he does with efficiency and precision, a rare trait today! 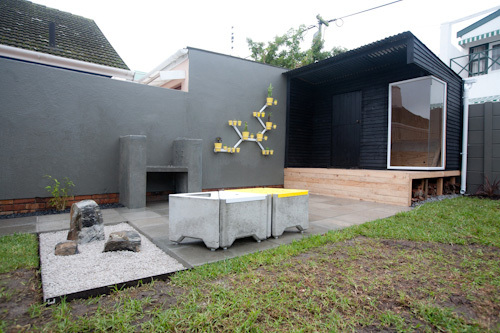 As regular readers know, I’m a modernist, I prefer clean lines and have a penchant for mid-century design, including landscaping. In designing it I bought several Sunset and Better Home & Gardens patio design books from the 50’s/60’s at local thrift shops and bookstores and spent countless hours on Pintrest and Houzz. I wanted to work largely with evergreen form plants, sculptural plants in shades of green, grey, crimson and salmon pink. 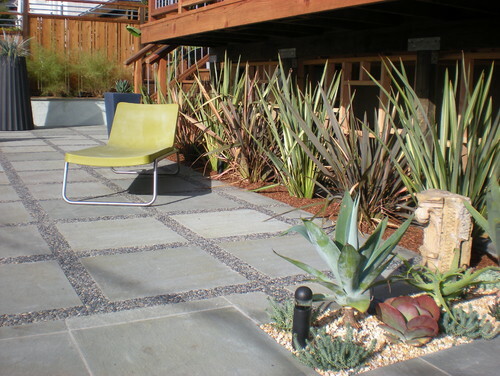 I found an invaluable landscape resource over at the Eichler For Sale website with a list of commonly used mid-mod plants. 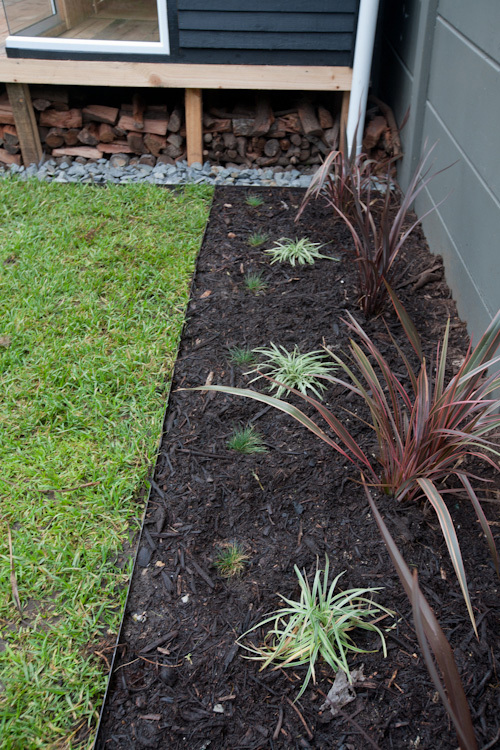 The selection is minimal, two varieties of New Zealand Flax (Phormium Tenax), some Lily Grass (Ophiopogon Variegata) and Blue Mountain Grass (Festuca Glauca) in one bed. Cape Reed Grass (Chrondopetalum Tectorum) in another and lastly Hedge Bamboo (Bambusa Multiplex) in another. The Flax will grow rather tall and create a nice hedge in time, as seen below. Bamboo is a tricky one as most Bambusa varieties are runners, once you get them in the ground they can send out meters of invasive shoots. This particular variety, Bambusa Multiplex, doesn’t do that, it forms cumps that grow into hedges in time, about a meter wide and up to 5 meters high, as seen below. Part of the mid-mod ethos is inspired by the simple lines of both Scandinavian and Japanese design. I wanted to include a stone garden and spent a few hours scrambling through a granite quarry to find these particular rocks. 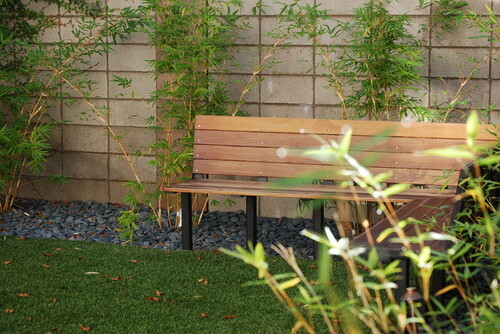 I plan to culture moss on them and when the weather warms up end July plant a beautiful Japanese maple to accompany it. 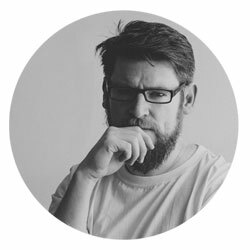 I turned to Joe Paine to help me create a living wall accent by way of his Kreep planters, he also made up a set of his Trihard stools, to be used as additional seating. All that remains is for me to put the final touches on and in the cabin and the arrival of our patio table (which I designed) and chairs. Hi Nix, thanks for the kind words. It seems simple enough, but the hours of deliberation, gosh! Glad that it turned out the way I envisioned it. PLEASE use Multiplex, there are one or two others like Nana that also work, but 90% of the bamboo (Bambusa) family are runners, once they are in the ground you’ll regret it as they can trail for meters and are very invasive. 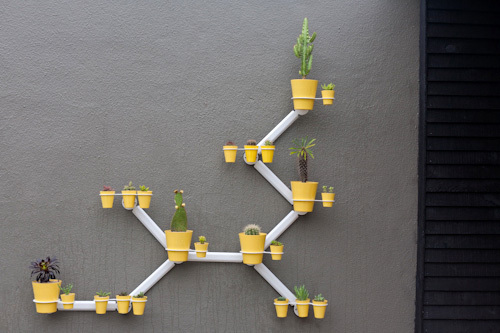 Alternatively keep them in pots. One of my favorites is Bambusa Nigra, commonly called ‘Black Bamboo’, but it to will get out of control if not confined. Wow! Great job! You are right it does look like something from My country. Love how you stowe the fire Wood underneath.